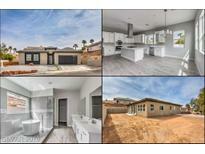 Below you can view all the homes for sale in the Calico Ridge subdivision located in Henderson Nevada. Listings in Calico Ridge are updated daily from data we receive from the Las Vegas multiple listing service. To learn more about any of these homes or to receive custom notifications when a new property is listed for sale in Calico Ridge, give us a call at 702-323-5903. Ready to move in, just bring your tooth brush! MLS#2083973. Signature Real Estate Group. This unique home features a large pool-size lot with RV parking/gate, viewing deck, waterfall, covered patio, upgraded kitchen with granite countertops & tile backsplash, four bedrooms with full bed & bath downstairs, three car garage & wet bar & gas fireplace in family room. Truly one of a kind! MLS#2084632. Windermere Prestige Properties. Master bath has barn door, glass tile shower with two shower heads, stand alone tub, his and her walk-in closets. MLS#2082490. Precision Realty. Sprawling master w/bay window seating area,walk in closet & large bath w/personal sinks.Beautiful front & back landscaping w/covered patio,raised rock viewing site,fruit trees & amazing view! MLS#2079547. Signature Gallery Of Homes. Beautiful backyard w/covered patio & ceiling fans,pool w/waterfall & spa! MLS#2062944. Signature Gallery Of Homes. Landscaped pool sized back yard w/extended brick covered patio & spa WOW! MLS#2078385. Signature Gallery Of Homes. This home checks all of the boxes and will bring a smile to your face. Come and see it today! MLS#2077719. Keller Williams Market Place. Formal Living & Dining Room; Designer Fireplace, Upgraded Lighting MLS#2068922. Century 21 Americana. Don't miss out on this one! MLS#2067612. eXp Realty. Too much to list, must see to appreciate. Cozy Fireplace in living room. MLS#2049504. KB Morris Real Estate. Spacious Calico Ridge Custom Home On 0.34 Acre Lot, Courtyard Entry Has Stairs That Lead To A Deck That Offers Beautiful Strip Views,Entry Has Hardwood Flooring,Huge Living/Dining Room W/Fireplace, Separate Family Room W/Wet Bar & Fireplace, Spacious Master Suite W/2-way Fireplace, Kitchen Has Granite Counters & Hard Wood Flooring,Ceiling Fans & Mirrored Closet Doors Throughout,Backyard Has Covered Patio, Built-in Bbq & Sparkling Pool,Much More! MLS#2035103. BHHS Nevada Properties.